The first Christmas card entered the Fibro two weeks ago. Two. Weeks. Mr7 smuggled it home in his school bag, more interested in the lollipop that came with it than in the card itself. Until he realised that he had the first card. The only card. Which, as far as he’s concerned, pretty much makes him the most popular member of the household. Personally, I think that the first week of November is a little early for Christmas cards. Mr7’s card has hung, in splendid isolation, in the acreage of the living room venetian blind (see image), for nearly 14 days now. It looks very lonely. We have all fully appreciated it from every angle. 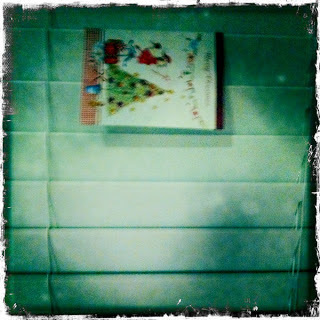 Longterm readers of this blog will know that I am a fan of the Christmas card. I like to send them. I like to receive them. I have already bought some splendid examples from Leaf Journals. But there’s no way I’d send them before the first week of December. Maybe the second. And I don’t tend to give them to people I see all the time. I don’t do The Exchange. What do you think? Can you peak too early with Christmas cards? When’s the optimum time to send (and receive)? Oh, and where do you put yours?